Lucy Hodgetts is a final-year PhD candidate at the University of York and is researching nostalgia and urban change in London, 1790-1830. As part of this ongoing series on Teaching Romanticism we will consider the ways in which we lecture on and discuss individual authors, whether during author-specific modules or broader period surveys. I thought it would be particularly useful to hear about which texts educators use and in what context, whether they place certain poems or prose works against those of other writers, or use contemporary or modern theoretical texts, or something else entirely. For this strand of blog posts I invite academics across the world to share their advice and tips on any aspect that interests them about teaching Romanticism. Many thanks to all of those who answered my call through NASSR-L, The BARS Review, and elsewhere (lightly edited samples are reproduced below with permission of the authors). Please do feel free to contact me with proposals for future subjects. We will be considering a range of writers, canonical and non-canonical alike, in the coming months. This issue was commissioned by Lucy Hodgetts. This posting is split into two parts. Stay tuned for part II. At the University of Wisconsin—Green Bay, I teach Frankenstein in a modern British literature survey course. I focus a part of my coverage on the first major global city that the reader encounters. This city is not London, Geneva, nor Ingolstadt, but Saint Petersburg. Stuart Curran points out that “Petersburgh” is the novel’s first real setting, and that this fact is “not a mere curiosity, but a careful signal” of the “intellectual and cultural dimensions” of the unfolding tale. 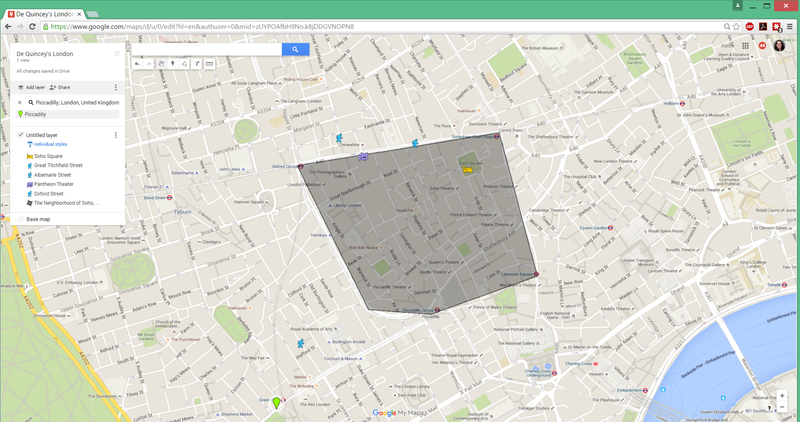 We bring up Google and tour the city, including its Street View on Google Earth. It is indeed an impressive place, even a beautiful one. We inspect the snow-frosted River Neva. 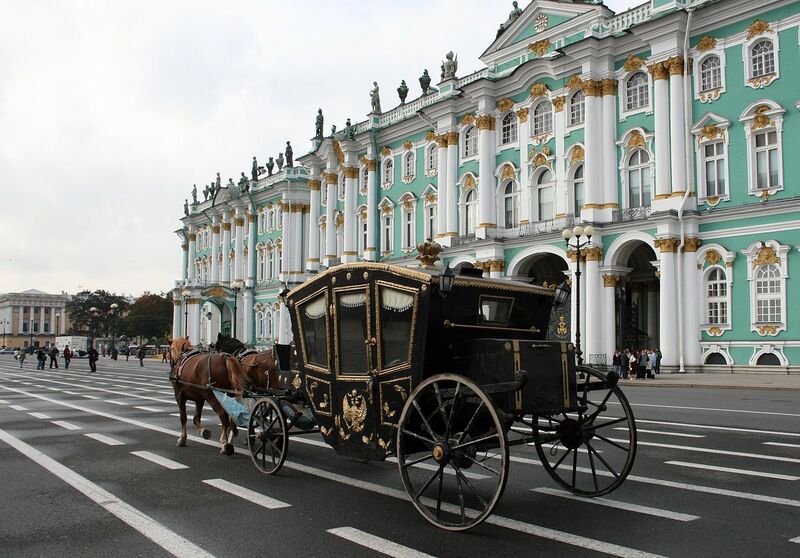 We marvel at the orderly beauty of the Winter Palace and the wedding-cake opulence of the twentieth-century Avtovo and Novocherkasskaya metro stations. Here in Green Bay, Wisconsin, these images are uncanny. We have snow piled up on the frozen Fox River and pedestrian tunnels for its avoidance. The Volneyesque remains of two Victorian train stations taunt us, for the passenger trains are long gone, a casualty of the American automotive-petroleum industrial complex. Shelley’s “Petersburgh” is a kind of city we perhaps once were, and perhaps might now have been. We can imagine Walton walking Peter’s streets and our own: staring out toward the Arctic unknown and the vast sublimity of the Great Lakes. Next, I show the 1797 Britannica entry linked to “Petersburgh” in Curran’s edition. We make an idea web charting this city’s significances and its ethical status. Yes, it is a capital of enlightenment and a near-miracle of engineering. 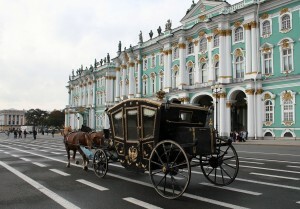 It is the absolute metropole of the Russian Empire. (Some students are amazed that this is not Moscow.) But then, there are the more chilling details: Peter’s ambition “almost in despite of nature,” his “ill-provided […] workmen,” the land “desolated by war,” the deaths of an estimated “100,000 men,” and how “nevertheless the work proceeded with incredible vigour and expedition.” Probably, the direct death toll was closer to a few thousand. That still places the cost at one 9-11 at least. Curran finds the Petersburgh reference a foreshadowing of the novel’s concern with the Enlightenment’s “dream of the new city or of the new human.” Fred V. Randel has focused on Petersburgh as the destination of the grande armée, which was decimated by nature in spite of Napoleon’s ambition. Mindful of these contexts, we parse Walton’s earliest letters. We can see how he and Victor share Peter’s ambition, his talent, and his values. From the “city of bones” below Walton’s feet, Shelley takes us to Victor’s charnel-house—and also to the cities we inhabit, founded likewise upon cruelty and ingenuity. What is the takeaway from this detour? I let the students tell me, as Peter’s builders haunt them across the unit. We find that cities aren’t only made of buildings. They’re also made of people. The lives of those people might be the true measure of a city’s enlightenment. That in turn might explain why modern urban development requires not only engineers, city planners, real estate developers, business leaders, and the like, but the humanistic explorers whose civic duty is constantly, vigilantly to build, monitor, reinforce, and reinvent our foundation in ethics and self-knowledge. Intermediate literature courses on my campus must cover multiple time periods and/or genres, with a strong emphasis on interdisciplinary readings when possible. My urban literature course focuses primarily on London, with the Romanticism unit covering roughly the middle third of the semester. Following the opening unit of eighteenth-century readings about urbanity, proper behavior, and public vs. private identity, the Romanticism unit examines the many ways in which urban identity is unstable, urban behavior unpredictable. 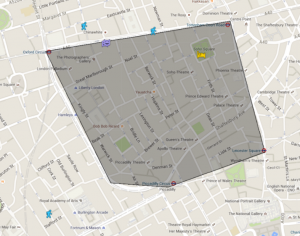 Inspired by a discussion of passages from Franco Moretti’s Graphs, Maps, Trees: Abstract Models for a Literary History (2005), students use Google maps to mark various places named in De Quincey’s Confessions of an English Opium Eater: Soho Square, Oxford Street, Albemerle Street, the Pantheon Theater, and so on. They comment on the shifting demographics of Soho Square in the early nineteenth century, on the neighborhood’s proximity to both a major retail thoroughfare and the theater district, on how this particular neighborhood shaped De Quincey’s public persona of the Opium Eater. Although many students are satisfied with approximate map locations, at least a few students in every class want to identify the specific stoop where De Quincey fainted and Ann revived him with a cordial; they are frustrated by De Quincey’s vague description of his plan to reunite with Ann on Great Titchfield Street. This clash between general area and pinpoint locations initiates a new round of discussion of the ways in which De Quincey constructs an imagined, idiosyncratic version of London. De Quincey’s city is an impressionistic series of personal landmarks and public places converted to private meanings, a space in which the author’s opiated haze transforms the oldest part of the city into uncharted lands. Noting De Quincey’s assertion that he returns often to look for Ann, students debate whether he hopes to meet her again or returns only to refresh his own connections to each site of his pilgrimage. The discussion of Confessions wraps up with Michel de Certeau’s chapter “Walking in the City” from The Practice of Everyday Life so that students develop a more complex understanding of the social construction of space. They learn to recognize how personal and public meanings overlap and contest all spaces. The combination of Moretti and de Certeau helps students move between analyzing concrete details and abstract ideas, making the city at once more familiar and more strange. I teach Romanticism as part of Oxford’s 1760–1830 paper. Many undergraduates approach the period with the preconception that the Romantics were obsessed with nature and therefore hated the urban, so I encourage my students to look at a range of texts that consider the city. 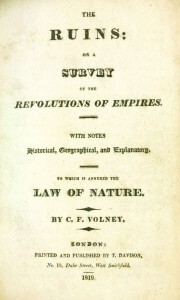 In addition to looking at literature that considers the hustle and bustle of the contemporary city, though, I also like to introduce my students to some of the haunting texts written in the period that imagine how cities such as London – enjoying growth and prosperity during the Romantic era – will come to fall into ruin in the future. 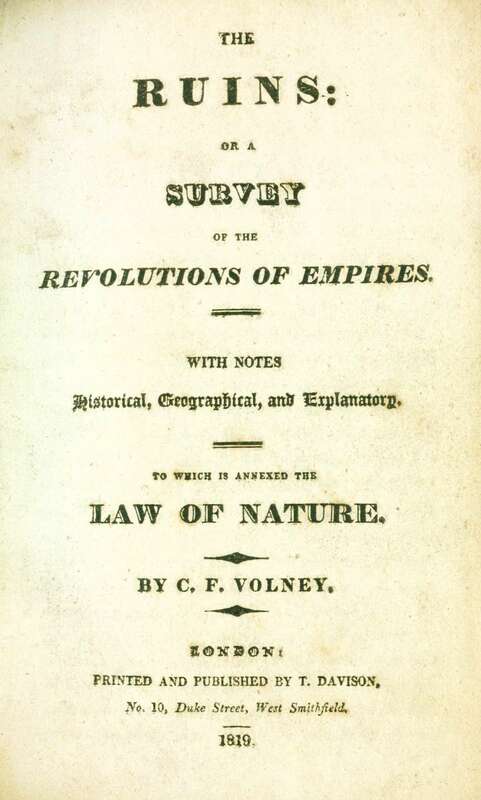 A good way into this is to get students thinking about how a text such as Volney’s The Ruins (1791), written during the turmoil of the French Revolution, teaches us that all empires are transient, no matter how mighty they appear at the time. This, in turn, can lead to Byron’s depictions of the ruins of Rome in Manfred (1816) and Canto IV of Childe Harold’s Pilgrimage (1818), the desolation of the crumbling remains of this once-great empire enhanced by Byron’s presentation of the dominance of nature over the city’s ruins. A key text that responds to the prospect of the fall of the British Empire specifically is Anna Letitia Barbauld’s controversial satire Eighteen Hundred and Eleven, A Poem (1812). Students are able to see how Barbauld responds to the ongoing Napoleonic Wars by presenting Britain as complacent, before imagining how the nation will ultimately see its glories reduced to ‘mouldering stone’. Barbauld’s presentation of a ruined London as a future tourist destination for prosperous Americans, and specifically as a space that prompts a meditative state for these ‘pensive and thoughtful’ travellers, can be particularly interesting when considered alongside Volney and Byron. Students keen to look at poems a little more off the beaten track will find similar ideas explored in Joseph Bounden’s The Deserted City (1824) and Eugenius Roche’s London in a Thousand Years (1830). In terms of prose, Mary Shelley’s The Last Man (1826) is a great text in that it functions as a history of the imagined fall of the British Empire, depicting the death and silence of various post-apocalyptic deserted cities, including London. I encourage my students to think about why Lionel Verney – the novel’s narrator and the Last Man on earth – decides to travel to Rome following the death of humanity, getting them to compare Mary Shelley’s melancholy depictions of the abandoned streets of contemporary cities with Lionel’s peaceful contentment when looking at the ruins of the Coliseum.